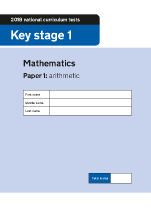 The Key Stage 1 Mathematics test is made up of two papers, an Arithmetic Paper and a Reasoning Paper and they are taken by children approaching the end of Year 2 (6-7 years old). For those of you who have children approaching this age it can be a worrying time but there is no reason for children not to be fully prepared, including knowing what the papers will look like, and we have published copies of previous tests which are all free of charge. 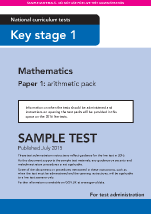 The Arithmetic Paper is expected to take approximately 20 minutes and the Reasoning Paper about 35 minutes, but there is no strict time limit. There is a good deal of guidance which schools use in administering the tests which can be found in the Test Administration Instructions. The papers must be taken in order, but they do not have to be taken on the same day. Both papers can be administered to the whole class, smaller groups of pupils or on an individual basis. • a rubber (optional). If rubbers are not provided, you should tell pupils that they may cross out any answers they wish to change. • number apparatus e.g. 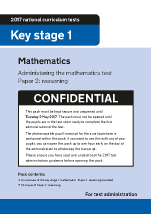 ten base materials, number square, number lines etc. To reiterate, the papers have plain areas in which to do working out but squared paper can be used if that is what your child is used to. 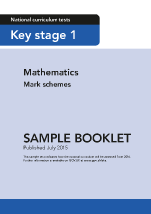 Calculators and any number apparatus e.g. a number line cannot be used. On the Arithmetic Paper, questions can be read out loud, but only the numbers, not the mathematical symbols. This is to make sure that an unfair advantage is not given to children who have the paper read to them. Final answers should be put in the boxes provided. If they want to change an answer they should draw a line through their incorrect answer. Note: a reversed digit is acceptable if it is clearly recognizable as the digit intended but transposed digits (e.g. 17 rather than 71) should not be counted as correct. As parents going through a past paper, there is no reason why this guidance must be followed. In fact, we would recommend talking to your child about the tests and going through each question with them, step by step. We have published previous papers that are free to use for anyone with a trial. 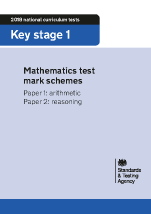 Once the tests have been marked your child will get a raw score; the actual number of marks they get in the tests. This will be translated into a scaled score. A score of 100 means the child is working at the expected standard. A score below 100 shows that the child needs more support, whereas a score of above 100 suggests the child is working at a higher level than expected for their age. The maximum score possible is 115, and the minimum is 85.